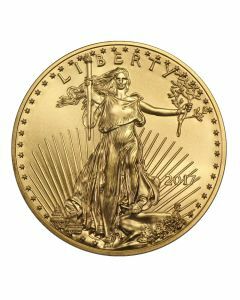 Just like the 1 oz American Gold Eagle coins, the half ounce American Gold Eagle strikes the perfect balance between collectible and investment. With its universally recognizable design, and its ability to be applied to a gold IRA, this coin is a great way to invest in gold bullion with a little style. The reverse of the 1/2 ounce American Gold Eagle coin shows Lady Liberty, as depicted by Augustus Saint Gaudens in the early 1900's. She holds an olive branch and a torch, and the word Liberty arches over her head. On the obverse, a powerful eagle flies towards a nest holding his mate and young, surrounded by the United States’ motto, as well as the markings that declare this coin worth $25 in currency. The ½ oz Gold Eagle weight is half an ounce of actual gold, and the ½ oz Gold Eagle dimension is 27mm around. 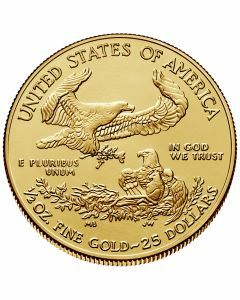 At SD Bullion, the 1/2 oz Gold American Eagle price is the lowest online, and represents a significant price difference from the standard full 1 ounce Gold American Eagle. This makes it much easier for a young investor, or an investor on a budget, to own one of these iconic gold coins. 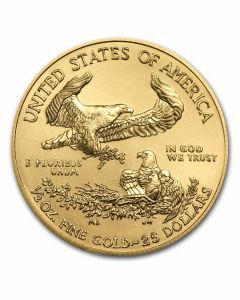 However, the ½ ounce Gold Eagles shouldn’t be thought of as something only designed for entry-level investors. These are still a great way to boost a portfolio, especially if an investor wants to include some highly liquid assets in their retirement plan. For example, it may be easier to sell a half ounce Gold Eagle coin than a one ounce Gold Eagle because of the price difference. Make sure to always evaluate the price of gold when selling, especially the historical price of gold and possible trends. When you hold a ½ ounce American Gold Eagle coin in your hand, you hold a part of American history. 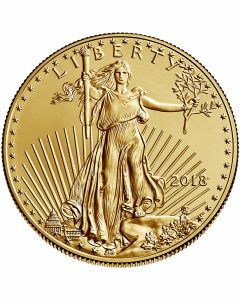 While modern-day American Gold Eagles have only been in production for a few decades from the US Mint, the design and icon go back to the early industrial era.